Check out the environmental books authored, co-authored or edited by SEJ members, and published in 2018 or 2019. Links to previous years also included. Members: Get your book listed! Esta es la comunidad electrónica de Sociedad de Periodistas Ambientales/Society of Environmental Journalists (SPA/SEJ). SPA/SEJ tiene varias actividades y publicaciones de uso e interés para periodistas de habla hispana. "Missoulian editor Best to head investigative news program in Maryland," KPVI News 6 (Pocatello, ID), April 8, 2019, by Rob Chaney. These annual awards honor the best media coverage of the developing world, reflecting the social, political and cultural life of people around the globe. 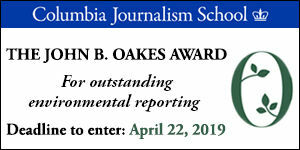 Awards are offered in many categories, including one for Environmental Reporting. Deadline is Feb 14, 2019. This year, long-time SEJ member Meera Subramanian joined our board of directors to give back for the many ways SEJ has benefited her freelance career. As Meera puts it, "Earlier this month, UN Secretary General Antonio Guterres said: 'We are in deep trouble with climate change. Climate change is running faster than we are, and we must catch up sooner rather than later, before it is too late.' Part of catching up is supporting the organizations that support the journalists covering climate change and so many other important environmental issues around the world." Read more and please give now. On January 25 in Washington DC, SEJ and the Wilson Center presented the 7th annual Journalists' Guide to Energy and Environment, where top reporters looked ahead at 2019's biggest stories to a packed house. "2019 Journalists' Guide to Energy and Environment"
#SEJ2018 in Flint, Michigan, hosted by the University of Michigan-Flint, took place Oct 3-7, 2018. 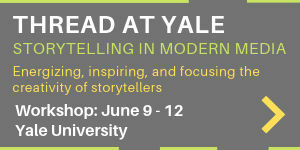 Find multimedia coverage here (including audios of most sessions), peruse the agenda or read speaker bios. If you attended the conference, please complete the survey to help us make next year's conference even better. It's critically important to SEJ to gather evidence on the impact of our work. 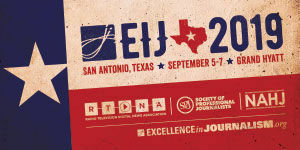 Please help us to keep SEJ strong and share links, photos, copies of reporting generated or informed by this conference. Send your story links to Cindy MacDonald, SEJ's Web content manager. Moderators, speakers, tour leaders: we also welcome resources, tipsheets, etc., from sessions or tours that you wish to share on our coverage page. Image: Environmental Justice panel "Elevating and Improving Our Reporting on Environmental Justice Issues". © Dale Willman/SEJ.